Lussekatter or Lucia rolls are saffron buns from Sweden. These lightly sweetened buns get their bright color from saffron. These are a treat during the long dark winters of the Scandinavian countries. Some recipes are more special to us than others. They connect us to the culture and traditions. Every culture, every region in the world have them. 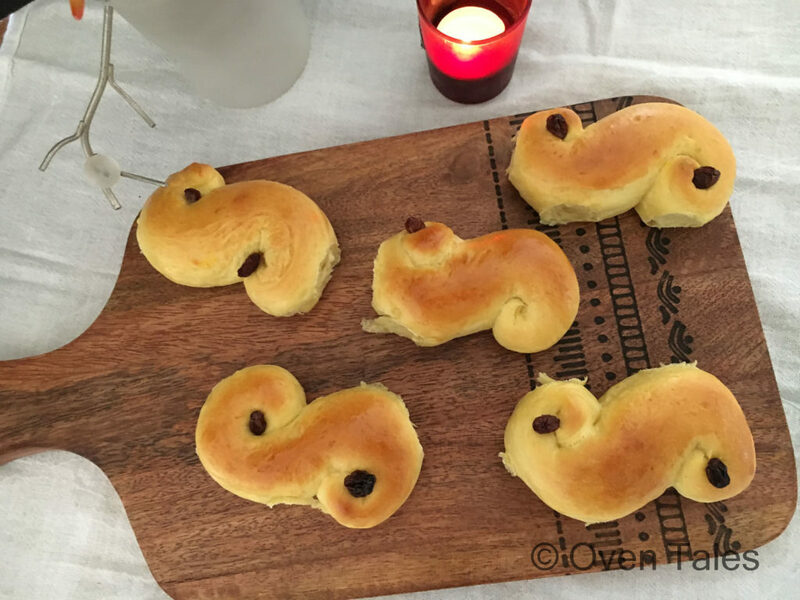 Lussekatter is such a beautiful bread that is part of the Swedish tradition of celebrating St.Lucia’s day. 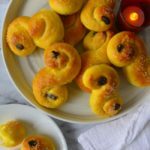 These rich saffron buns are delicious with a mug of coffee or in my case with a cup of cardamom flavored chai. Be sure to give them a try !! St.Lucia’s day falls on December 13th. It is one of the biggest celebrations marking the start of Christmas season in Sweden. On this day the children serves Lussekatter and coffee to the members of the household. The stories behind the celebrations date back to the 4th century CE. Click here if you would like to know more about St.Lucia Day. In the midst of the holiday baking and sugar filled indulgences these soft buns are are a welcome change. Frankly I would love to have them anytime! The beautiful color of the bread is thanks to the little bit of saffron in the dough. The bright golden color is a celebration of light during the time of longest, darkest nights. Isn’t it a lovely amalgamation of pagan and christian beliefs ? 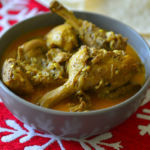 Saffron is a wonderful spice. The color and flavor it imparts is unmatched. It is also one of the most expensive spices as well. Thankfully a little bit is all that one needs. In a pinch safflower can be substituted, though it does not quite have the same effect. 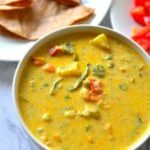 In the picture above I rubbed a pinch of saffron in the palms of my hands and added to warm milk – in a few minutes the milk turned a lovely yellowish orange. Often times I leave the saffron strands as is. The milk changes color, and the strands themselves when kneaded into the dough gives rise to bright specs of color in the finished product. 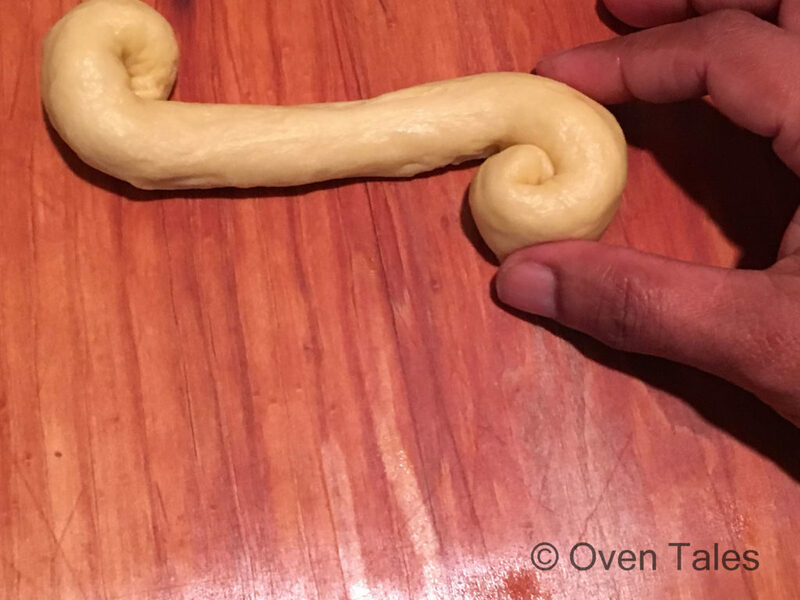 If you have a stand mixer use it to make this dough. It takes much less time, but more importantly it is less messy, as the dough tends to get sticky. You can reserve one egg white for egg was or use a fresh egg – that is upto you. Sometimes I sprinkle sparkling sugar (decorativ e sugar or sugar pearls ) over the buns as well. Enriched doughs usually takes longer to bulk up in size. Usually this dough takes 1 1/2 hours to double in bulk at room temperature. You could let it rise slowly in the fridge as well. The long slow rise definitely improves the flavor. 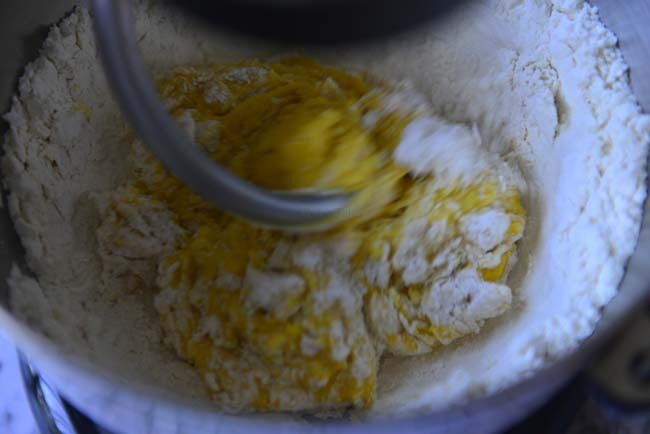 Once the dough has doubled in size punch it down the dough and divide into pieces ( about 18 pieces from 4 C flour dough). Roll each piece into long ropes – 12″ to 14″ in length. You might have to roll it even longer. 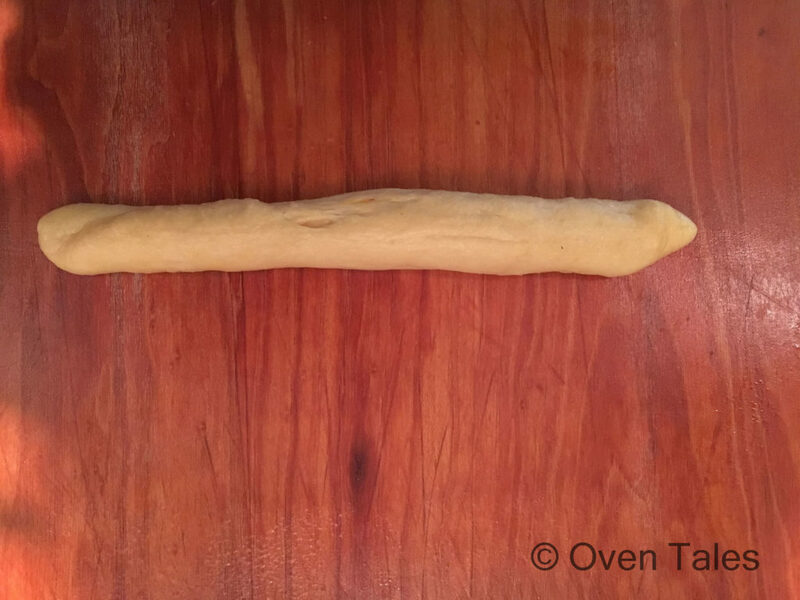 This dough is very elastic and shrinks a little as you stops rolling. Turn the ends to form an S shape with curled ends or form into 8s . 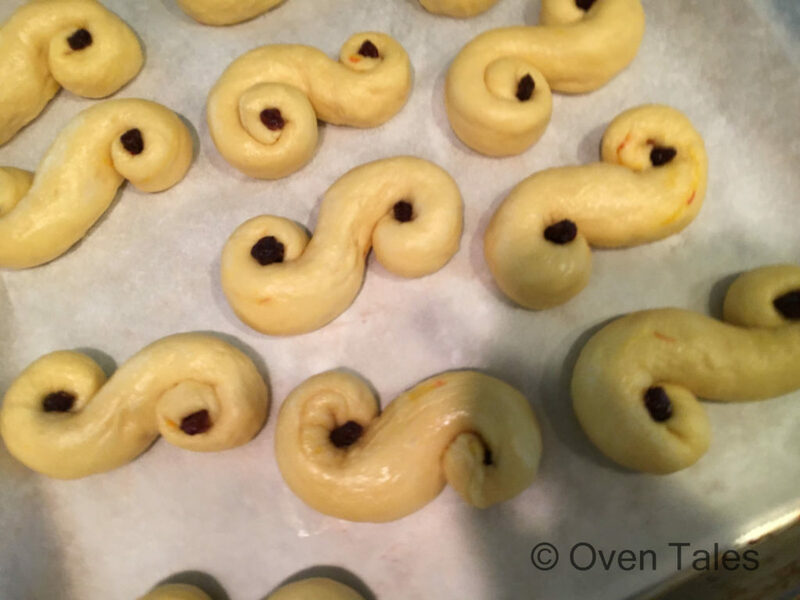 Press a currant or raisin into the center of the curls . Brush the tops of the buns with the egg wash. If desired sprinkle sugar on top. These buns do expand nicely in the oven . Place them at least an inch from each other. 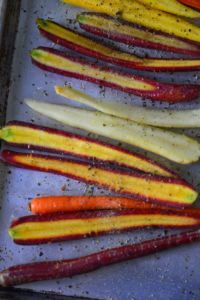 Transfer the buns to the oven and bake for 15 to 20 minutes. Take the buns out of the oven and transfer to a cooling rack and cool completely. These taste wonderful warm or cold and they freeze well too. Here is the recipe – hope you enjoy these buns as much as we did ! 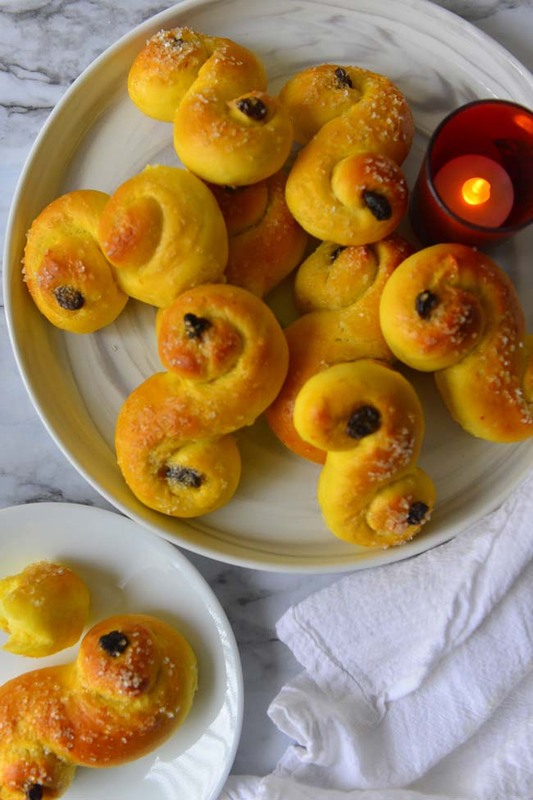 Lussekatter or Lucia Rolls are the saffron flavored buns from Sweden. These are traditionally made with an enriched dough and rolled into lovely S shape. Saffron in the recipe infuses unique flavors and give the buns a lovely yellow hue. Crush the saffron. Heat 1/4 C milk and sprinkle the crushed saffron on top. Set aside to cool to room temperature. 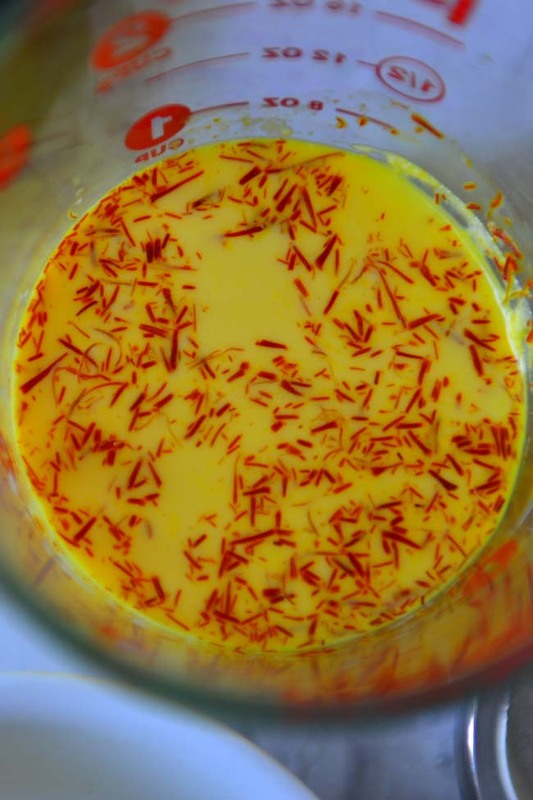 While the saffron is infusing the milk, warm another 1/4 C milk to 110°F, or just warm to touch. 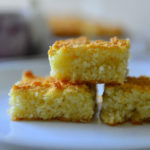 Mix in 1 tsp sugar and sprinkle the yeast on top. Set aside to activate. Separate one egg into yolk and white. Reserve the white. Add the remaining egg to the yolk and beat lightly. Measure the flour, sugar and salt into a large mixing bowl. Mix and make a well in the center. 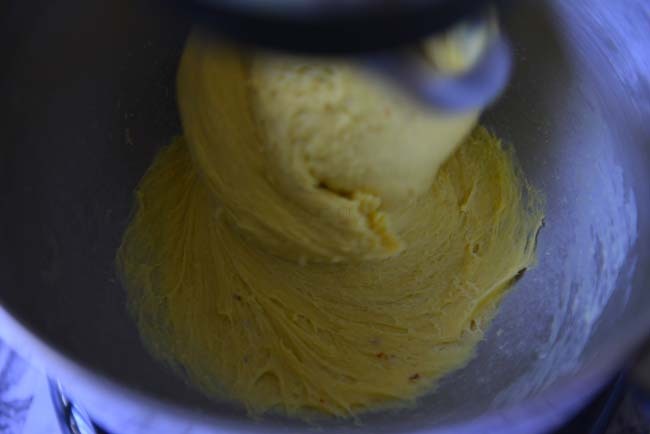 Add the activated yeast, the cooled saffron infused milk, and the egg mix to the well. Slowly knead the dough adding the butter and enough of the remaining milk to make a smooth dough. 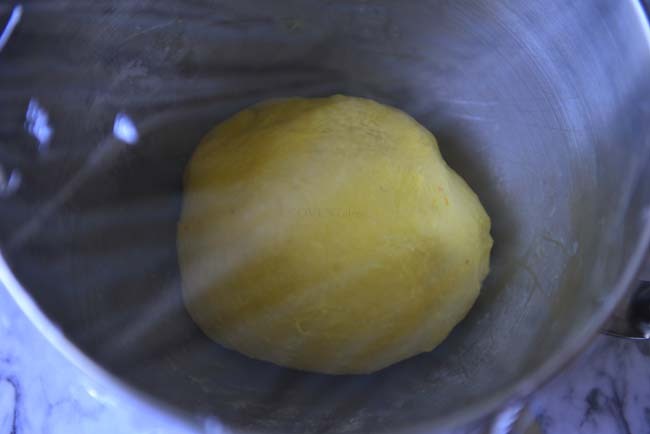 Knead for 10 minutes by hand or 4 minuts in the stand mixer, until it become soft and pliable. Form into a ball. 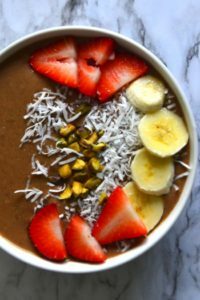 Place in a large covered bowl and let rise in a warm place until doubled – about 1 to 1 1/2 hours. 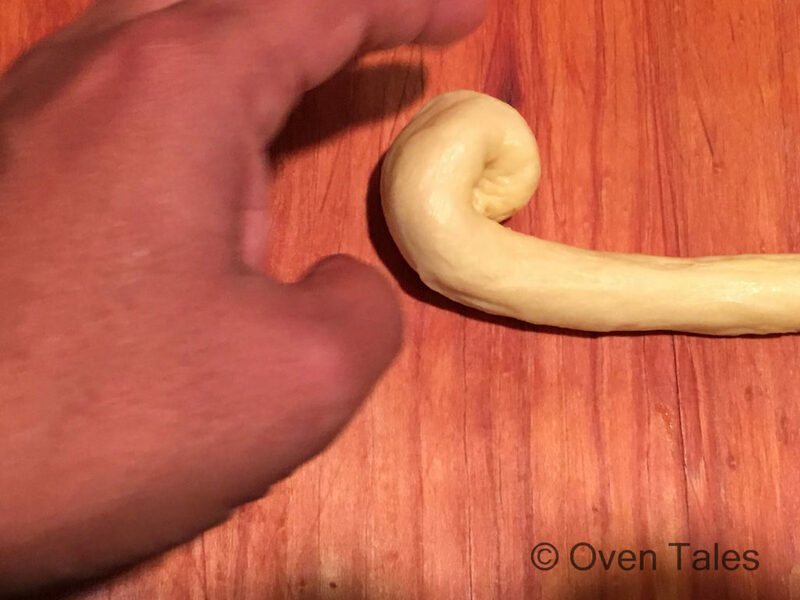 Punch down the dough and divide into 12 pieces . Roll each piece into long ropes – 12 to 14″ in length. Turn the ends to form an S shape with curled ends or form into 8s. Insert a raisin/ currant into the grooves. Place the shaped buns on a baking tray. Cover and let rise for 30 minutes. Preparing an egg wash by beating the reserved egg white and 1 tsp of water together. Brush the tops of the buns with the egg wash. If desired sprinkle sugar on top. Transfer the buns to the oven and bake for 15 to 20 minutes. 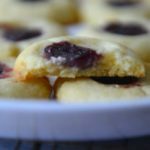 Baking this recipe will surprise each of you as the aroma filled the whole house and all your guests will have to wait for rolls impatiently. These buns look so good! 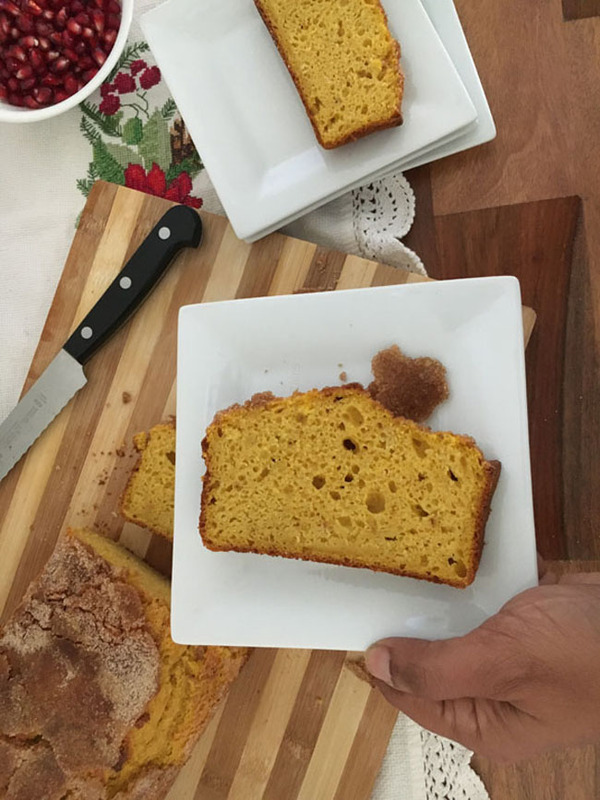 Thanks for sharing a bit of the history and the recipe!